Yeah, a dude actually wrote that, and a couple of people actually upvoted it. I’m trying to understand the logic: Goldwag is growing older and more homosexual (do men usually become gay as they age?). 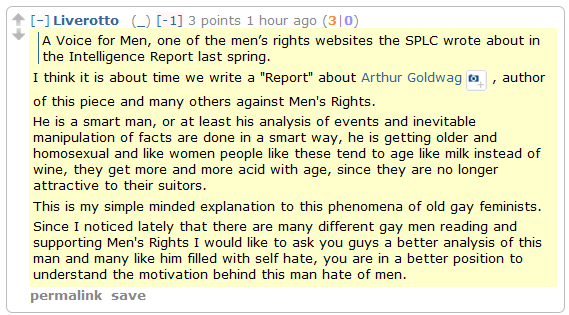 But gay men age badly, which makes them mad at their “suitors.” So therefore Goldwag has come to hate the (mostly straight) men of the Men’s Rights movement? Another highlight of the discussion: The r/mensrights regular who thinks I’m Paul Elam. No, really. Posted in: antifeminism, crackpottery, homophobia, misogyny, MRA, paul elam, reddit, whaaaaa? Dilute vinegar is also good for washing windows. I am really not happy unless I have at least five kinds of vinegar in the house. With vinegar and baking soda both at hand you could conquer the world, yo. They laughed at me in 4th grade! But I’ll show them! I’LL SHOW THEM ALL!! Not one single iota of affection for Alastair Reynolds among all this Banks/Stephenson love? I’ve only read a couple of Banks books and more of Reynolds, but so far, I’m preferring Reynolds. “Terminal world” was really meh, but the rest of the stuff I’ve read by him I absolutely love. AND he treats his female characters like they’re people, just like the male characters. Banks always seem to be wanking with one hand and writing with the other when putting a female character together. They’ll cast Keanu Reeves as Hiro, you know they will! I’ve yet to read Reynolds, I’m getting to him though, I promise I will in time, but for the moment my list consists of Watts, Stephenson, Banks, Vinge, Doctorow, and Stross. And I swear, If they cast Keanu Reeves as Hiro, I will lose all faith in humanity. justaloser: The name says it all. The psychic legerdemain these people have to perform has to give them blood clots in the brain.